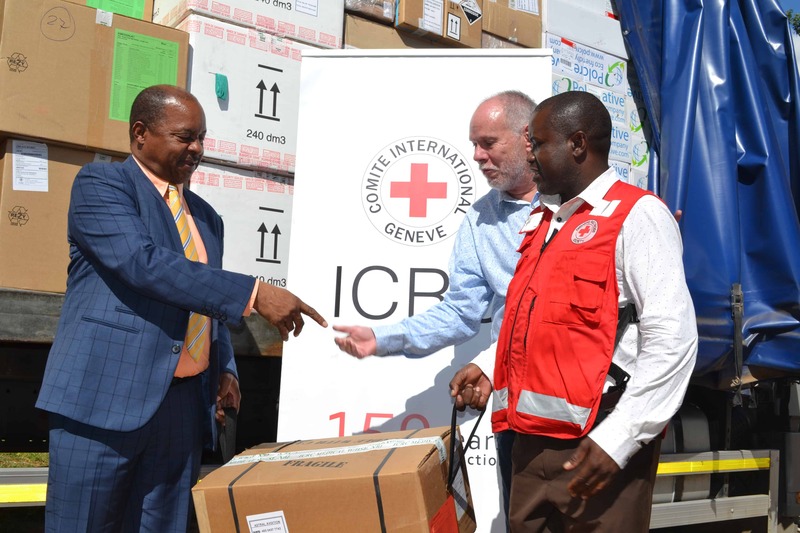 The International Committee of the Red Cross donated $89 000 worth medicine to the Ministry of Health and Child Care to assist victims of the Cycone Idai disaster that rocked parts of Manicaland, Masvingo and Mashonaland East. The donations were handed over to the minister of Health and Child Care, Dr Obadiah Moyo at Natpharm premises in the capital yesterday. The package that was donated included anesthetics, oral hydration salts, dressing material and hygiene equipment to reduce infection. The donated goods are expected to last for the next two weeks. Dr Moyo expressed his gratitude and thanked the international community for extending their helping hand. He added that the international community was responding to President Emmerson Mnangagwa’s call having called for help since the time the country was hit by cyclone Idai. Dr Moyo revealed during the hand over ceremony that children in the affected areas where now facing problems of parasites due to wetness. “The Provincial Medical Director for Manicaland has confirmed this morning that the children who were affected by the Cyclone are now being affected by parasites, so hopefully there is something to attend to them in this whole package,” Dr Moyo said. Red Cross national finance director Zimbabwe, Morris Machawira said his institution was pleased to part of those organisations that have managed to extend a helping hand to the government at the time of need. “We are happy as an institution to be helpful at at a time of need. It is our duty as an organisation to respond to the welfare of our people,” Machawira said. Tropical cyclone Idai left trails of destruction in parts of Manicaland province in Zimbabwe, Mozambique and Malawi due to heavy rains and strong winds causing floods in the process. Damage from the cyclone has caused problems with water and food supplies, sanitation, electricity, transportation, shelter, communications, security, medical care, and mosquito control. Contaminated water supply, reduced access to food and proper shelter are some of the conditions that may lead to the outbreak of infectious diseases.